They both share a strong disdain for Donald Trump. Their work-out routines are world-famous (though her’s a little more so). One of them loves strong women, and the other is among the strongest women in the world. It’s time to stop denying what the fates have long decided: Armie Hammer and Ruth Bader Ginsburg should get married. According to Jones, Hammer may have reminded Ginsburg of Marty, evidence that true love can strike twice. No matter that Hammer is married. By his own admission, love knows no boundaries: he met his current wife, Elizabeth Chambers, when she was dating another man. Hammer’s father, too, met his mother when she was in a relationship with someone else. What’s to keep him and Ruth, who are clearly in love, from moving forward towards marital bliss? 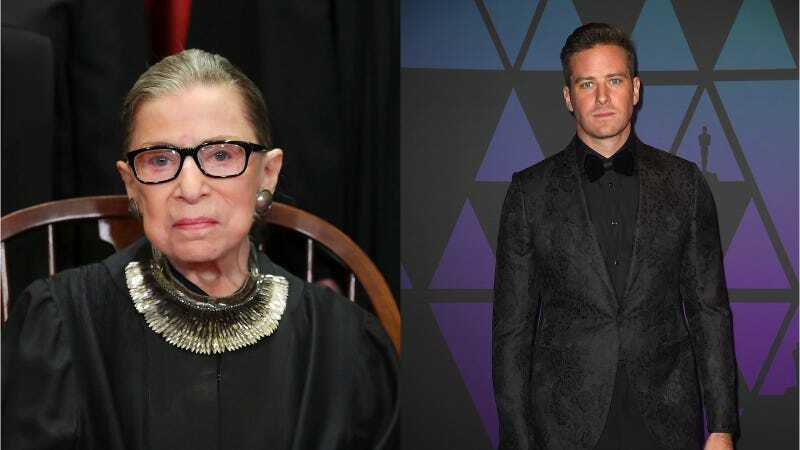 Ruth Bader Ginsburg and Armie Hammer should get married. Not just for love, but for democracy.